What do get when you combine one of the best songs of the 90’s with one of the best tv shows of all time? I was feeling somewhat forlorn on the weekend. The ABC have been screening Dr Who repeats nightly in anticipation of the new season and they have just finished the David Tennant era. I know people would beg to differ on the whole Proclaimers issue- I am sure my sister Fiona would as I played it sooo many times when it first came out- but I still have a soft spot for it :). 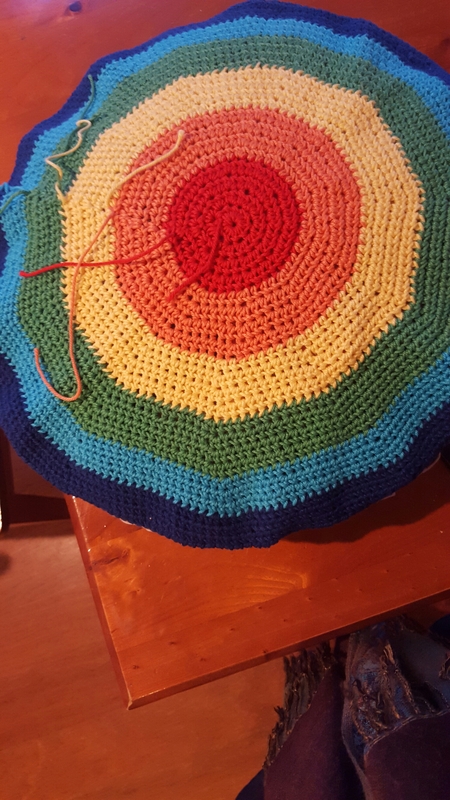 It’s the back of a circular cushion cover, and this is the front. The insert of the cushion is one which had been sitting on Miss BG’s bed for some time, featuring members of a popular boy band. Miss BG’s fondness for One Direction has waned (cue sigh of relief), and an idea for a project presented itself. 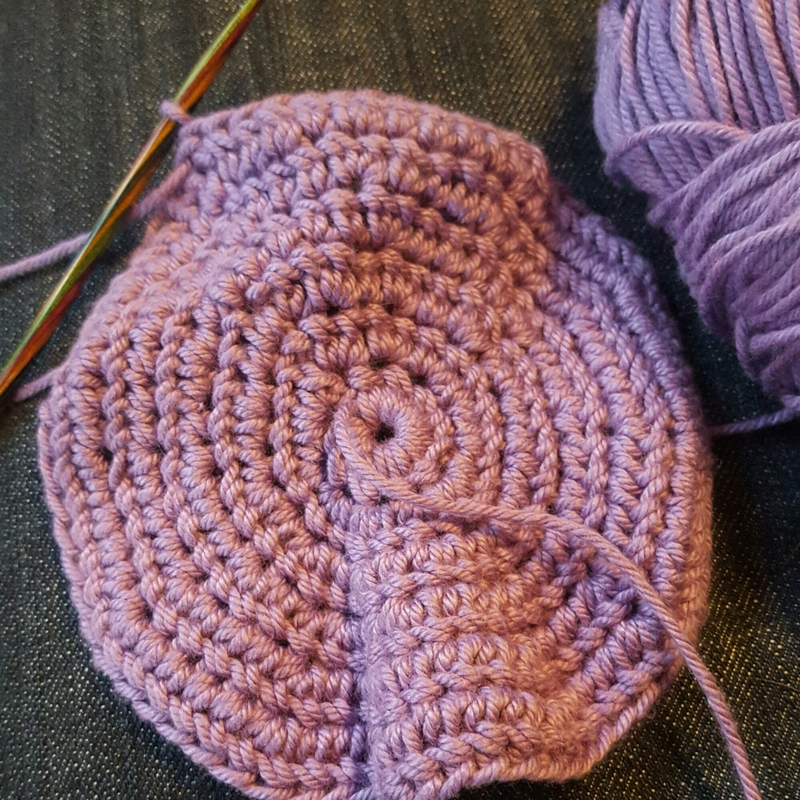 As the project also involved using up yarn from a previous project, it was a win win situation :). I’ll be taking it with me on my next work trip, which is tomorrow! Kim spoke of her maker space in her home that she shares with her partner. 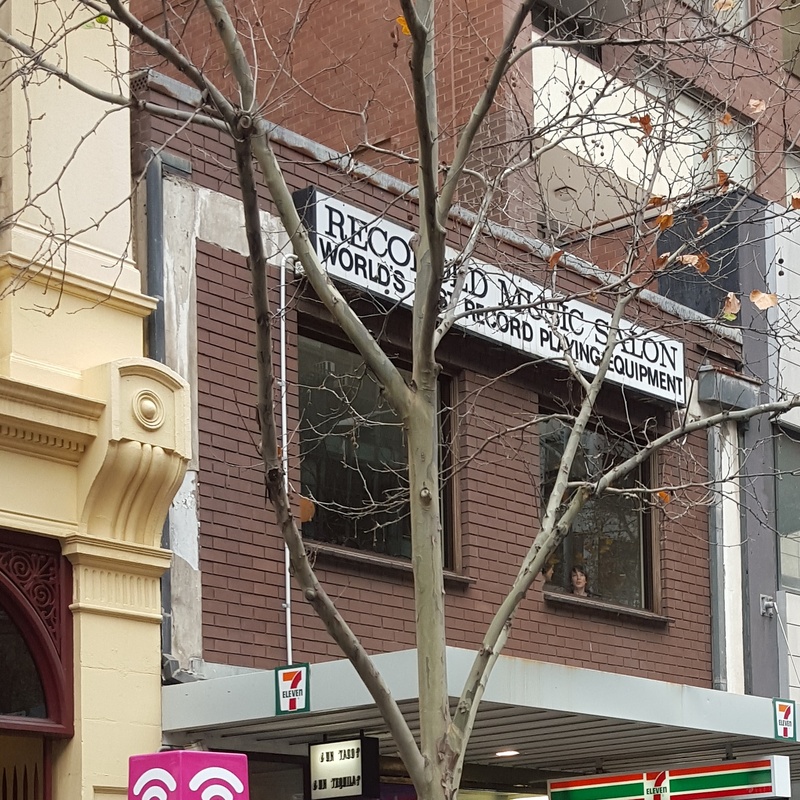 It is fantastic to see people’s creative spaces and places! I blog on my iPad or phone, crochet at the tennis, swimming pool, train, plane (not in the car as I am the designated driver :mrgreen:). I knit while watching TV (my crochet skills are sadly not up to this level). My craft projects live beside my bed, hanging from a hook on the back of the door. 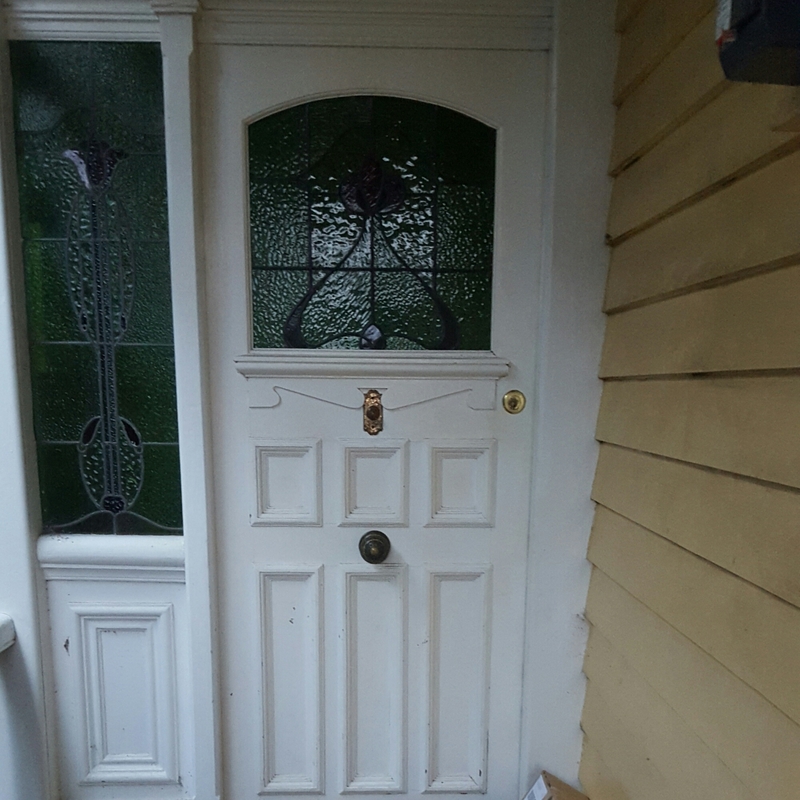 This is my front door, a white door with lead lighting in the window. It means I am home, after a long day at work, or from travelling for work. Sometimes I have Mooch waiting to be let in at the front door, especially if she has heard the car pull up. If I am lucky, there is a parcel at the door. Inside it is warm, with a lovely hum from the presence of my family or the central heating. I have been away from the family for work a bit the last few weeks, and it’s not easy. I am thankful that MrBG is there to keep things ticking along, and I know the kids are in safe hands, even though there seems to be a suspicious amount of white bread and chocolate mousse (in the form of a ‘dairy dessert’) being consumed in my absence. After the craziness of the last few weeks at work I am glad for a refuge here. To cut a long story short, I am an 80s tragic. 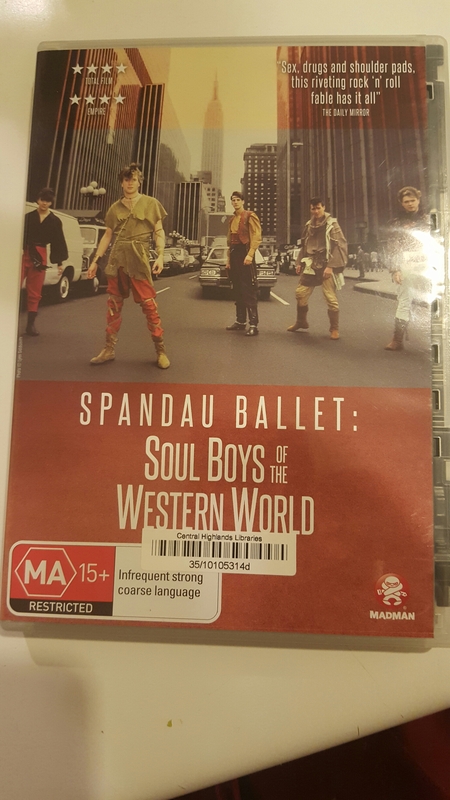 MrBG knows me all too well and last night we watched a documentary on Spandau Ballet. Directed by their manager Steve Dagger, and narrated by all the members of the band, it is a tale from their beginnings in North London around Islington to their formation at school, their rise to fame and through to the present day. The Soul Boys of the title refer to how their early influences were American soul- Stevie Wonder was rated as a strong influence by Gary Kemp, the songwriter of the group. Their look came from being part of the New Romantic movement which formed around the club the Blitz in soho, which also featured people like Steve Strange, Boy George and Marilyn, which you see in photos and footage. Much of the footage is from home movies, and seeing their earliest shows in 1977 when they were still at school is pure gold. It is this candid footage of these wild boys living it up, with their voices as narrators which make this film feel true and authentic. Their acrimonious time in court when Tony Hadley, John Keeble and Steve Norman sued Gary Kemp for a share of royalties was dealt with in a broad fashion, and there seems to be an attempt to deal with both sides as objectively as possible. It is a nostalgia trip through my teenage years, and it was also fun to see glimpses of Duran Duran as their rivals in pop chart success. If you’re a fan of 80s British pop, do yourself a favour and watch this DVD.